UCF remained undefeated last Thursday with a 52-40 home win over Temple, taking control of the AAC East in the process. 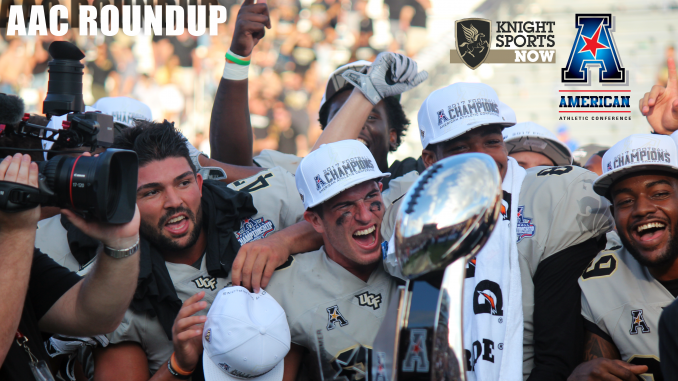 The Knights (8-0, 5-0 AAC) fell two spots to No. 11 in both the Coaches Poll and AP Poll while remaining at No. 12 in the College Football Playoff rankings. They host Navy this Saturday, but before we get there, let’s check in on what else went down around the AAC in week 10. With their win on Thursday night, the Knights took sole possession of first place in the AAC East. With one conference loss each, Temple and Cincinnati are within striking distance, though UCF now holds a head-to-head tiebreaker with Temple. South Florida’s loss damaged title hopes beyond repair, as a whole lot of chaos would have to unfold for the Bulls to jump three teams for the top spot in the division. Cincinnati, which faces South Florida this week before coming to Orlando on Nov. 17, will be UCF’s biggest threat in the division. Because the Knights hold the tiebreaker over the Owls, it would take losses in the final two games to create an opportunity for someone else to claim the division. All of these “what ifs” are irrelevant if UCF continues to win anyway, but there is that chance that the rest of the teams knock each other out before the Knights even play their two biggest games of the year. The Cougars can still win the division by winning their final three games, but one loss will put the Mustangs in control of their own destiny. As of now, the AAC Championship Game would still feature a matchup between UCF and Houston, but things could get wild very quickly.